RSUPPORT (KOSDAQ:131370), a global cloud provider of remote support and control solutions, announced that it would kick off the full-blown sales of ‘RemoteMeeting’ and ‘TAAS’ in North America. 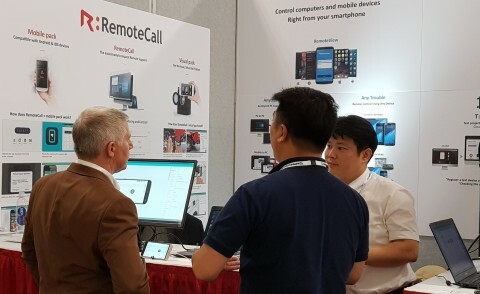 RSUPPORT participated in the Mobile World Congress America 2017 San Francisco from September 12 to 14 and introduced the two new products. ‘RemoteMeeting’ is a solution to change the methods of task performance and corporate communication, while ‘TAAS’ is a solution to improve mobile business productivity. Officially released in April, ‘RemoteMeeting’ is a cloud-based 100 percent web browser video conferencing service. It has a cloud-operated browser platform with intuitive UI so that users can start or join a meeting easily without seeing manuals. It is the only Korean cloud video conferencing service to be equipped with the patented strong LOUNGE UX. RemoteMeeting provides high-definition images and stable connection through Multipoint Control Unit which was developed solely by RSUPPORT, and boasts convenience of use, which was made possible by the UX which can implement online meeting room habits as their offline habits are. RemoteMeeting satisfies different needs such as teleworking, customer counseling and meetings between branch offices. The improved demo version of ‘TAAS,’ which debuted in the MWC Barcelona in February, was unveiled to the public. ‘TAAS’ stands for Test as a Service and means a cloud-based test service. It is a cloud-based, automated mobile testing service for mobile developers, which offer both cloud-based, and device-based testing. TAAS has its own original strong functions, and two of them form its core. They are automatic test script generation and wireless mobile connectivity testing. ‘Automatic test script generation’ is not a manual method by which a developer writes scripts personally, but an automatic one by which a tester’s action is written into test scripts. ‘Wireless mobile connection testing’ performs tests not by connecting PCs with mobile devices through USB, but by accessing WiFi, 3G, LTE and other wireless networks. 2017 RSUPPORT : Participates in MWCA 2017 and Taps North American Market with 'Remote..
2017 RSUPPORT : Globally Launches 'RemoteMeeting', a Cloud-Based Video Conferencing S..
2017 RSUPPORT : Globally Expands with 'Samsung Smart UX' Multi-function Printers Pre-..
2016 RSUPPORT : Announces New Mobizen Ver. 3.0 App for Smartphone Video Recording and..